Triple K Care Solution Ltd is a care agency based in Berkshire that is committed to providing experienced and highly qualified staff to facilities from across the care industry. Our relationship with Triple K Care Solution is very varied and covers accountancy, payroll and web design. The Company Warehouse began its relationship with Triple K Care Solution Ltd after we formed their company for them in 2012. Triple K Care Solution is a care agency based in Berkshire that provides quality care professionals to a range of medical facilities. Dedicated to providing the best quality service to their clients, Triple K Care Solution have a large staffing database that allows them to offer flexible and tailored placements that suit both the client and the healthcare professional, be they nurses or healthcare assistants. Triple K Care Solution Ltd is committed to treating every client with care and professionalism, meaning that they need their business to run as smoothly and professionally as possible. The Company Warehouse helps them to achieve this by providing our skilled accountancy and payroll services as well as designing and building Triple K Care Solution their own website. The smooth running of a business would never be achieved without expert accountancy services. After creating their company with us, Triple K Care Solution Ltd decided to outsource their accounting and payroll services to our expert accounting team. Providing unlimited ticket and telephone support, The Company Warehouse helps Triple K Care Solution organise their business accounts and file important government documents. As well as preparing and filing the end of year accounts and the annual returns, we also complete the company's tax returns. For a business that deals with a large number of employees on a regular basis, Triple K Care Solution looks to us to provide all that they need regarding payroll services. After setting up the company's PAYE registration, we now provide the company with a payroll platform from which we process their monthly payroll and provide HMRC compliant payslips for their staff. 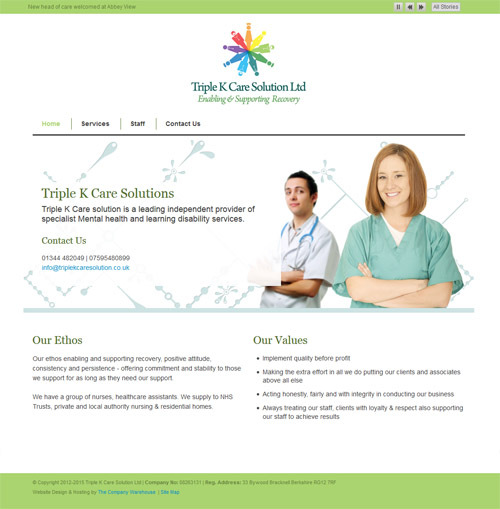 Triple K Care Solution Ltd needed a website that could provide the customer with the basic information on what the company did and the services that they provide. We registered the required domain for the business and then set about creating a website that best represented Triple K Care Solution and their values. The company wished to get across their core values and the belief that their high standard of quality care and support can only be delivered by staff that are valued, empowered and trained to a high standard. We created a simple but informative site that does not overcomplicate the company and their services, but rather focuses on delivering the core values of the company to the customer. We also created a business email address so that Triple K Care Solution could be contacted by customers through an email address branded with their own name.